Talk about a sight for sore eyes! 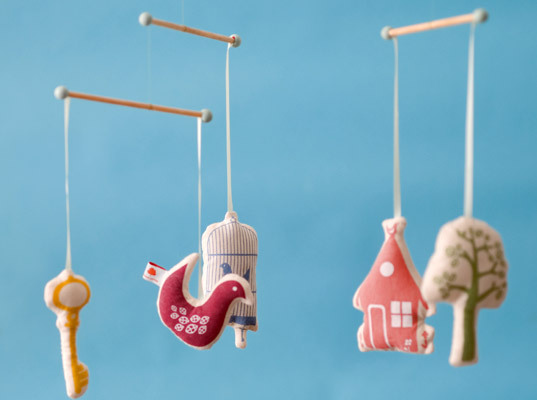 With moving plush silhouettes made from 100% organic cotton, along with a little fairytale about the figures, Ferm Living’s Story Mobile is bound to entertain sleepy (or not-so-sleepy) babies for hours. For extra company, snuggle up with a family of birds just like the one floating on the mobile. The trio of organic cotton pillows, available in small, medium, and large sizes, comes in a coordinating palette of soothing hues that are too tweet for words. Talk about a sight for sore eyes! With moving plush silhouettes made from 100% organic cotton, along with a little fairytale about the figures, Ferm Living's Story Mobile is bound to entertain sleepy (or not-so-sleepy) babies for hours. For extra company, snuggle up with a family of birds just like the one floating on the mobile. The trio of organic cotton pillows, available in small, medium, and large sizes, comes in a coordinating palette of soothing hues that are too tweet for words.